OnePlus 5 was officially announced on 20th June, i.e., a couple of days back and just after a day of the official announcement; the phone is receiving its first Software update that brings a lot of enhancements. Even the Kernel Source of the phone is already available for Download. So, you can probably guess why the OnePlus devices are called ‘Developer-Friendly.’ Anyways, the new software update weighs around 160MB. 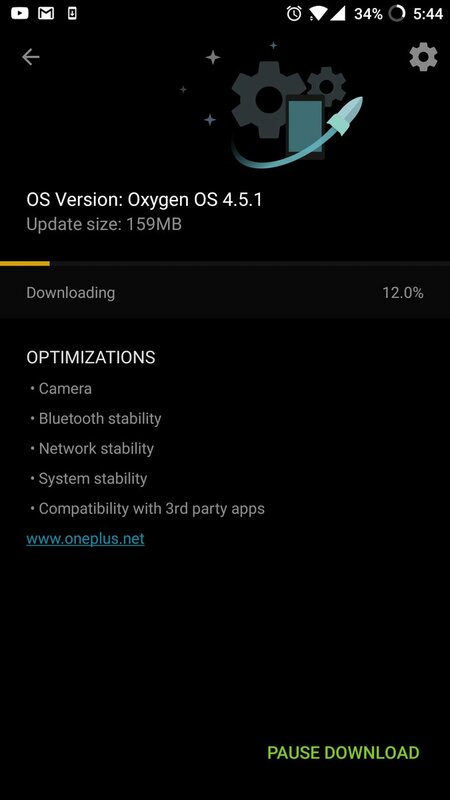 The phone runs Oxygen OS 4.5.0 out of the box, and this new update has been tagged as Oxygen OS 4.5.1. ONEPLUS 5 FIRST SOFTWARE UPDATE – WHAT’S NEW? The phone is set to launch in India today, and this new update is surely good news for the Indian users that are going to buy it. The phone will be available to purchase from 4:00 PM today in India. Talking about the specifications, it features a 5.5-inch Full HD AMOLED display, Snapdragon 835, Adreno 540, 6/8GB RAM, 64/128GB Storage, 3,300mAh battery and Dual Rear Cameras ( 16MP Main + 20MP). So, what are your views on this new Software update that is being rolled out for the phone? Do let us know via the comments section.